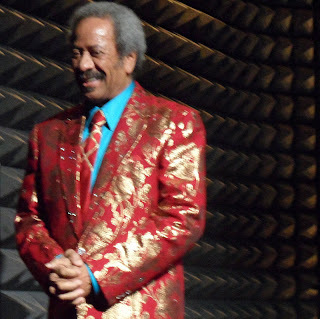 Allen Toussaint is a songwriters who's career has spanned more than 50 years. I have often seen Toussaint's name in print and recall hearing his name from an old friend of mine into music coming out of New Orleans. So prior to Wednesday, what I knew about Toussaint was limited to knowing he was a well respected piano player from New Orleans and he wrote a few songs like "Mother In Law" and "Working in the Coalmine." As Wednesday unfolded and in the days since, I've been finding out more and more of what makes Toussaint a legend. For example, "Yes, We Can Can" and "Happiness" were always two of my favorite Pointer Sister songs...duh!..the songs were written by Toussaint. The Labelle album Nightbirds with "Lady Marmalade" and "What Can I do for You" on it....duh, duh, duh... was produced by Allen Toussaint. And then there's "Southern Nights" which was not only the name of the 1975 album which Toussaint was revisiting on Wednesday, but is the album title song that was a giant hit for Glenn Campbell in 1977. 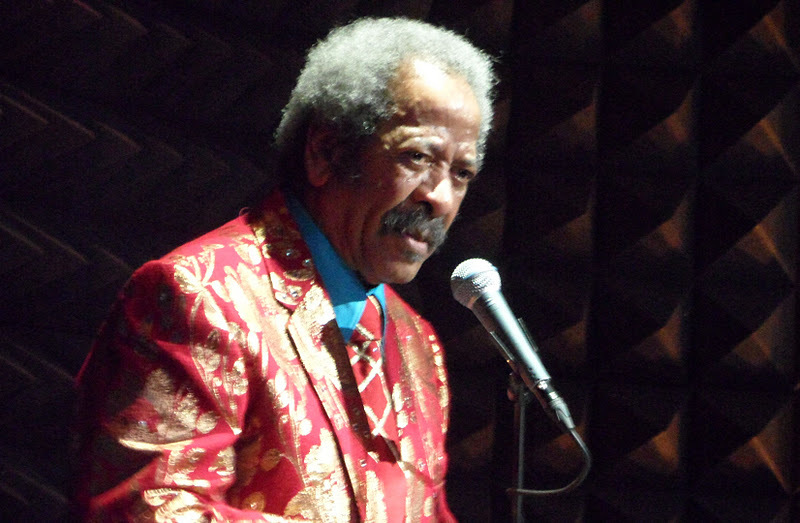 I have heard many people play the piano at Joe's Pub but something about the way Toussaint played it made it sound very different. He went from "Southern Nights," with lots trills, flourishes and arpeggios, played in the higher register of the piano, directly into "Country John" with it's low funky bluesy feel. That second song cooked! Tousaint dazzled the audience by using a combination of piano honky-tonk riffs that flowed in and out over a thumping octave bassline. Toussaint isn't wanting for piano licks because he has more than a bag of tricks - he's got a ton barrel! For "You Will Not Lose" he had a bassline riff that seemed to have a spring to it. The song had a spiritual undertone accented by strong musical themes. When he finished the song he started to explain some of the songs he just played. He then referred to "You Will Not Lose" by saying "That one right there was written when Dionne Warwick was hot with her fortune tellin'. " The audience laughed but at that moment the comment went right of my head. I had forgotten about the Physic Network. I guess even though Warwick did her Physic Network commercials in the early 90's, she started getting into astrology in the 70's when the song was written. Toussaint may be classified as an R&B artist but it's definitely not in the Motown (or Stax for that matter) sense. There is definitely Boogie Woogie influences in Toussaint's sound. So, it felt as though "Last Train" was almost a given with its stride piano feel and notes imitating a steam whistle. Toussaint spoke about his father being a big band trumpet player who as he put it "couldn't improvise but could play all the parts." He said when his siblings were born, his father had to find a different gig and started working on the trains. He then made the audience laugh by saying his father influenced the song but there was a double entendre in the lyric about a young women he used know, ending the story by stating that she didn't get any royalties. Toussaint did a few more songs from his Southern Nights' album, with next up being "World Wide," which coincidentally reminded me of Billy Preston's "Nothing from Nothing." After playing "When The Party's Over," Toussaint admitted that he was going to go directly into the next song but started to play the wrong song. Then he confessed that during the show the night before, he repeated a line when he forgot a lyric to the very same song. He pointed out that someone who was in the audience from the night before had sent him an email. The audience chuckled. He also made me laugh when he finished "Basic Lady," he said "I know this is a hip world we're livin' in but we still like those basic ladies." The guy that sat next to me with his family, before the show started, said he was a little disappointed to see just a piano on stage. He said he was hoping for a band. But I was absolutely thrilled to hear Toussaint with just a piano. The man is so smooth. I'm sure it takes a certain amount of stamina to play an hour and a half show but Toussaint made it look effortless. The parts of the show when Toussaint just played piano instrumentals were my favorite. Toussaint did a show busy bit after his two instrumental pieces, which I assume he did in case he lost the audience. (Trust me, with his piano playing, losing the audience wasn't likely to happen.) He started that portion of the show by talking about New Orleans and stating that "people ask how y'all doin' down there?" then he emphatically said "thanks to the wonderful people of New York who reached out to us in our time of need, we're doin' fine! Thank You!" He then played about 12 bars of the song "Mr Mardi Gras" before he told Joe's Pub's sound person to play the recording. It was Toussaint's time to bring some New Orleans flavor to the audience. He walked around stage, giving out small multicolored umbrellas and masks, which he wore, and then handed out to the ladies. It was a part of the show that showed the hospitable sweetness of Toussaints personality. After hearing him on the radio and seeing him person, I got a very warm feeling about him that said he really appreciated life and the people around him. The part of the show that amazed me most was "Piano, Piano." That's what it was called on the set list but basically it was stream of consciousness piano playing. Toussaint went through a number styles and songs from jazz standards to show tunes to classical themes to boogie woogie to blues and so on. When he finished "Piano, Piano," Toussaint said he'd written a number songs from the "Dating Game Theme" to "Mother In Law," but modestly stated "I'm not that good, I just been at it a long time." As he was about to do "Git Out Of My Life Woman," he mentioned how the song bugged him because five minutes after he wrote it he thought "wait, I didn't want to tell her that!" But nonetheless he did say that he was grateful to the Grateful Dead for making it a hit. Before the last song, Toussaint did a cover. It was funny because he asked the predominantly white audience to sing along. When he asked he said "All white folks know this song" and when we all sang along, he said "see - told ya." The last song displayed that not only is Toussaint a great songwriter but he's a great showman. The last song was a reprise of "Southern Nights." Toussaint first sang the song and then played the song's melody as he spoke over it. Toussaint described the south that he grew up in and how as boy his father would take him out of the city to the country. He described the country in daylight and then in the darkness of night. Toussaint's description flowed for quite awhile taking us completely into the world the inspired him to write the song. When Toussaint walked off stage after his last song, the audience applauded loudly but the applause wasn't prolonged. I think the audience was being respectful because Toussaint had done a long set. The funny thing was that as the audience was mulling about preparing to leave, Toussaint suddenly appeared to do his encore. We were all very surprised but in the same respect happy that he came back. 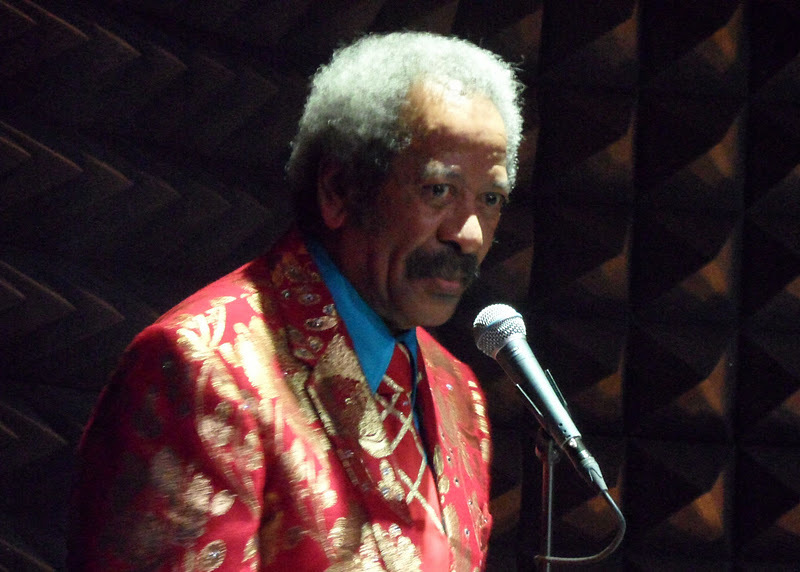 I guess he was back stage thinking something like "this is my last night of three at Joe's Pub - I'm gonna milk this sucker!" Toussaint did a greatest hits medley beginning and ending with "Certain Girl." He then finally ended with "It's So Hard to Say Goodbye." 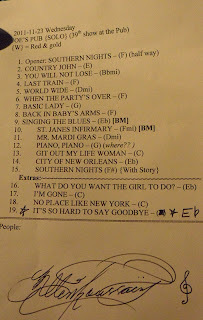 Before Toussaint left the stage he handed out his set list, for a second time, and shook hands with audience members. 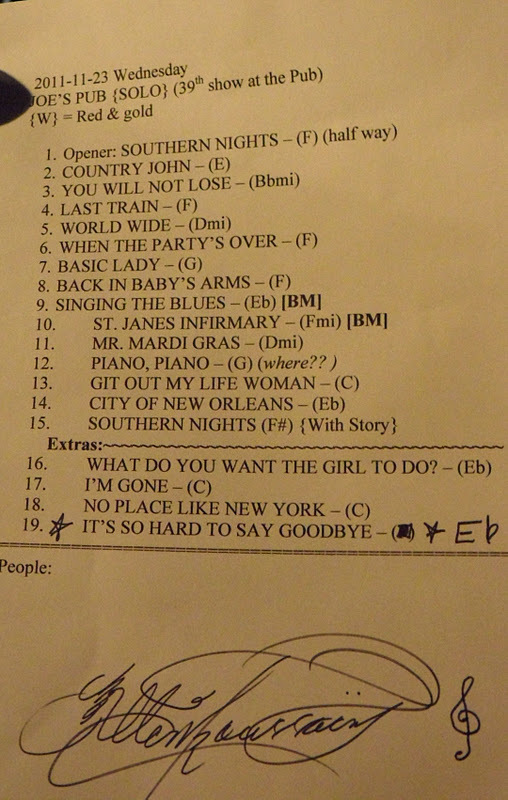 (The first time he gave out his set list was during Mr. Mardi Gras.) It should be noted that Toussaint did not exactly follow his set list. He dropped and added a few songs. That's why I posted the actual list in addition to the photograph of his autographed list.